Let’s say your company is sponsoring an event that requires a certain air of glamour, such as a theme event or an awards night, a marketing party or a dance recital. Or maybe you were invited to present your products at an exclusive demonstration to be held at a high-class hotel. You’ll want your corporate logo displayed in a manner that is very attractive and very elegant. 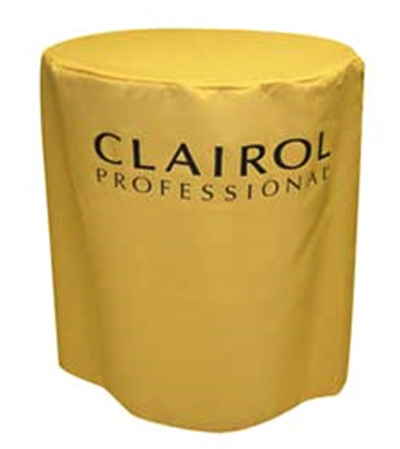 One way you can do that is by using brilliantly coloured tablecloths with the logo printed on it. Then the people attending these events would clearly know what your company is and what you do. Our full colour, dye sublimation barrel style table cloth precisely fits the bill. Our barrel-style tablecloths are remarkably substantial, vivid in detail and vibrant in colour. That’s because we only use fabrics with a thickness of 210gsm as well as dye sublimation printing technology in producing them. Dye sublimation printing is the most accurate and sophisticated fabric printing technology the market has today. It is known for producing sharp, realistic details and rich, stunning colours. Dye sublimation works with high levels of pressure and heat to create printouts. The image to be processed is printed in its mirror likeness on a piece of thermal transfer paper. The paper is then pressed onto the fabric that will become the table cloth using a special pressing machine. The pressure and heat from the machine causes the solidified ink on the paper to sublimate – that is, to transform directly into gas without going through the liquid phase first. The gaseous ink infuses the fibres of the fabric to create an imprint before solidifying once more. The resulting product will have rich details and brilliant colours. You’ll be proud to use them to decorate your displays at any expo, trade show or corporate event. Additionally, the imprint is permanent and highly resistant to fading and damage. You can use them frequently and have them washed or dry-cleaned without worrying that the colours will wash out or the logo printout will crack. Another advantage you will get from our dye sublimation tablecloth is you have full control over its design and colours. You can provide us with your desired layout for the cloth, or we can do the layout for you. As for the colours, you can pick the exact shade that you want. Just make a selection from the Pantone colour library, a book listing all the colours recognisable to the human eye, and give us the code. For example, let’s say you want a red tablecloth. You can be more specific and go for crimson, ruby, brick red, auburn, sunset, cardinal red, carnelian, carmine, maroon, etc. And so you can be sure that the table cover will be exactly as you want it, you can ask us to give you a sample print before we produce the final product. The biggest advantage you will get from ordering your barrel style table cloth from us is you won’t have to pay extra fees and you will save money in the end. We have three reasons for that. First, we only print in full colour and we charge a flat rate for it. We don’t charge per number of colours to be printed. So you won’t have to sacrifice quality for cost. Second, we won’t ask that you order a minimum number of tablecloths before we process it. We don’t require a minimum order. If you want just one printed table cloth, we can give you just one round table cloth at no extra charge. Lastly, our table covers can be used over and over again and for many different events, without risk of fading or damage to the printout. As mentioned earlier, dye sublimation technology results in permanent and damage-resistant printouts. You will be able to enjoy this product for a long time to come. Our barrel-style printed table cloths are classy items of decor. At the same time they are effective advertising tools that will help you raise awareness for your company and products. Call us right now for more information about our table covers.